Hi... I will not be talking about the importance of training your GSD - especially when it comes to "Obedience", because the GSD owners seem to have become far more aware of it these days. What I have come across recently while discussing with some of the community members is again a few more shocking stuff. 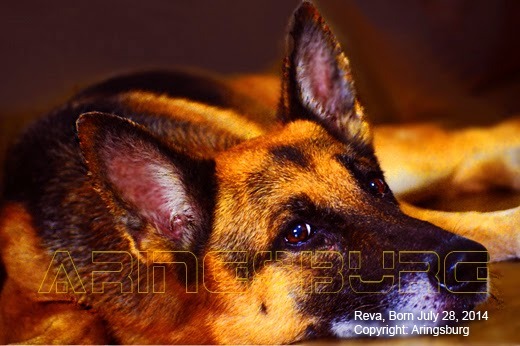 While some believed that not all German Shepherds are trainable even with rewards, because they are genetically stubborn, others said that using food as rewards may not be the best option, because finally you will want your shepherd to act on commands without food. Knowing that there are still some myths prevailing about dog training, I thought of publishing this post on Facts and Myths About Training German Shepherds. Myth: Some German Shepherd Dogs are genetically stubborn, which makes them tough to be trained well. Fact: Admitted that some GSDs may be more dominant than others, but that doesn’t mean that they cannot be easily trained. There is no suit-to-all dog training strategy. All dogs are different – and this is universally true and natural – just like human kids. Something that can work good for my puppy may not work at all for yours. A professional dog trainer tries to understand the specific traits that make a dog more dominant than his/her mates. As soon as he understands them he would be able manage the dog efficiently. Rewarding a dog for any good thing he does and refusing a reward for undesirable things will work good for almost all dog while training. But dominant dogs usually have tendency to disobey command. It is important for a trainer to establish the alpha membership (leadership) more effectively and train him/her in a separate area - away from animals and people. A dominant subject usually requires more time to learn tricks – but it’s not impossible. Same problem may arise with puppies that are born with overly high prey drive. Very high prey drive will result in higher degree of distraction, which compromises the puppy’s attention paying ability, making the training little tougher. However, even in this case training is not impossible. An “All-Positive” GSD trainer will try to avoid environmental distraction elements while training. Usually the distraction elements for a high prey drive puppy are anything that moves – may be a butterfly, a passing by animals, a flying bird and even the weathered/ falling leaves from the trees. So now you know what it primarily needs for you to train a dog that are genetically dominant or having overly high prey instinct. Myth: Using “food as a reward” while training your German Shepherd may not be the right option, because the dogs has to finally act only on command and without treat as a reward. Fact: Although many GSD owners still believe that their dog may become completely dependent on food to act, but this is a prevailing and most common myth about dog training. Food based reward training is a part of a very new concept, called Motivation Dog Training. Most of unsuccessful “food based reward training” results have occurred because of the fact that the trainers have been unsuccessful in using the food correctly while training a dog. Many dog trainers were noticed using the food as a bribe for an action to be performed. The rule is to use the food as a reward for the dog’s successful accomplishments of an action, which will motivate the animal to repeat his good work and NOT to wait for the treat (primarily) and work (secondarily). Another most important step is to make the dog’s habit of getting the food reward eventually fade out, simultaneously letting the dog know that he will be highly praised for all of his great works. Without applying the Motivation Dog Training rule properly please do not expect your German Shepherd puppy to work for you on command and not for food. Here is a great read about the basic rules of food based motivation dog training. Most important of all... your dog should never be left with a novice hand for training. Newbies and amateur dog trainers can be a real nightmare. Without professional knowledge Reinforcement Training can Severely Backfire.